Already we’re lost in lazy metaphors here, but if we apply each discrete self-applied sobriquet to Bannon and his role in the Alabama special Senate election, we find that the “street fighter” got KOed, the “wingman” got Goosed, and the keeper notched a spectacular own goal. Democrat Doug Jones narrowly defeated Republican Roy Moore to take over the seat vacated by Attorney General Jeff Sessions earlier this year, and Jones’ upset victory was a stinging slap for Bannon and his Breitbart lackeys. Moore’s candidacy was an obvious disaster from the start -- he is a howling extremist, virulently anti-gay, and he’d twice been booted off the state supreme court for refusing to adhere to higher court rulings. But for Bannon, this unstable and politically toxic yahoo was precisely the sort of “populist” candidate who could be counted on to support Trump’s (and Bannon’s) agenda. Bannon had such faith in Moore that he broke with Trump, who endorsed incumbent Sen. Luther Strange in the Republican primary, and hit the campaign trail on Moore’s behalf. “I think Roy Moore is the guy that's going to represent Donald Trump and fight the establishment,” Bannon told Sean Hannity in September. When the Washington Post broke the news that multiple women were accusing Moore of sexual misconduct -- including one woman who said Moore assaulted her when she was 14 -- Bannon was faced with a decision: abandon his candidate and risk ceding the seat to the Democrats, or stand alongside Moore as he faced credible reports of sexual assault. 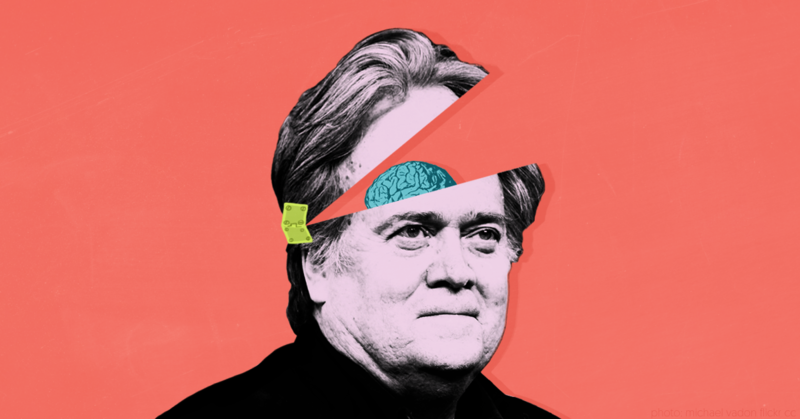 Bannon opted to stick doggedly with Moore and began concocting fanciful allegations of a conspiracy (stretching all the way to Senate Majority Leader Mitch McConnell) to discredit his candidate. Breitbart.com took up the cause with laughable attempts to undermine the Post’s reporting and construct a separate reality in which the reports about Moore had been debunked. Bannon coasts on a reputation as a master political strategist and presents himself to the world as a sort of frumpy modern-day Machiavelli. But throughout the entire Moore campaign, he’s demonstrated little in the way of political intelligence. Aligning with Moore was liable to backfire from the get-go -- he was a weak and vulnerable candidate even before reports surfaced that he was a serial sexual abuser. The only messages Moore had to offer voters were relentless grievance, vacant flag-waving nationalism, and whacked-out conspiracy theories. Well, it turns out they didn’t know that. And now Bannon, after all that feeble and unsteady “street fighting,” is left having to explain how a political strategist of such self-proclaimed insight and deviousness managed to help lose a Senate seat that the GOP should have had little difficulty holding onto. The easiest explanation is that Bannon’s reputation as a “street fighter” and master of the political dark arts is oversold nonsense, and the proof of that resides with senator-elect Doug Jones.